Yesterday’s analysis expected more downwards movement which is exactly what has happened. Summary: Price should continue to move lower overall with an increase in downwards momentum. The short term target at 1,217 may be met in one day, and the short / mid term target at 1,198 may be about two days away. 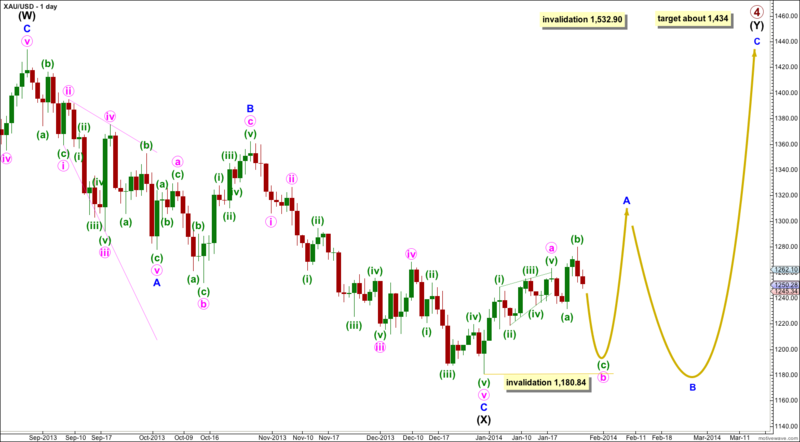 If intermediate wave (Y) is a flat correction then within it minor wave A must subdivide as a three wave structure. At this stage it looks like minor wave A may be unfolding as a zigzag because minute wave a within it completed as a leading diagonal which is a five wave structure. If minute wave b within this zigzag is over then at 1,314 minute wave c would reach equality in length with minute wave a. With the downwards structure becoming clearer I have adjusted the wave count slightly. I will discard yesterday’s alternate as its probability has further decreased. Minuette wave (c) is unfolding as a simple impulse, and within it subminuette waves i and ii are complete. Subminuette wave iii has begun and should move towards its middle within the next 24 hours. This should see some strong downwards momentum. I have redrawn the accelleration channel about subminuette waves i and ii. I would expect subminuette wave iii to move below the lower edge of this channel, and any corrections along the way down should find resistance at the upper edge of the channel. 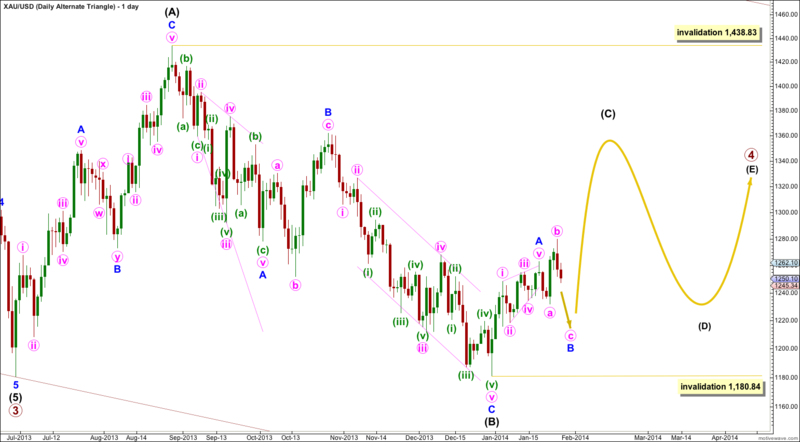 The target for minuette wave (c) is more likely to be at 2.618 the length of minuette wave (a) at 1,198. 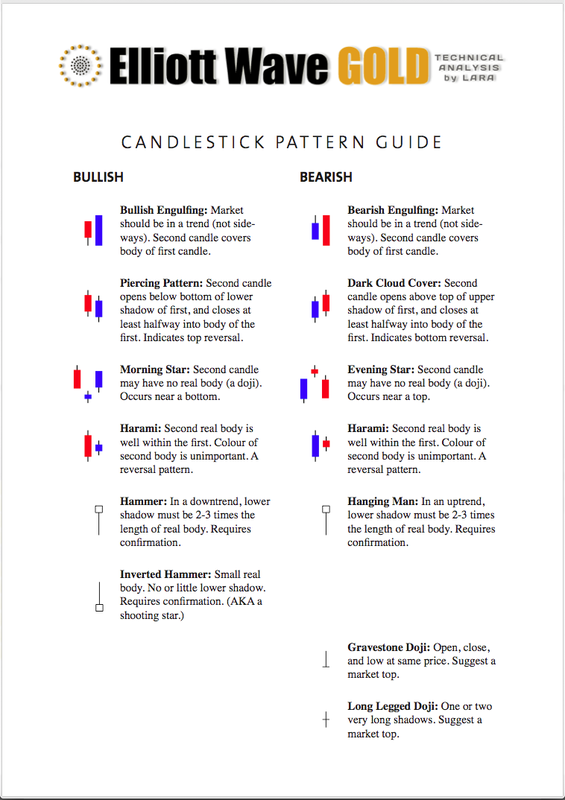 We may see another two red candlesticks yet for this target to be reached. 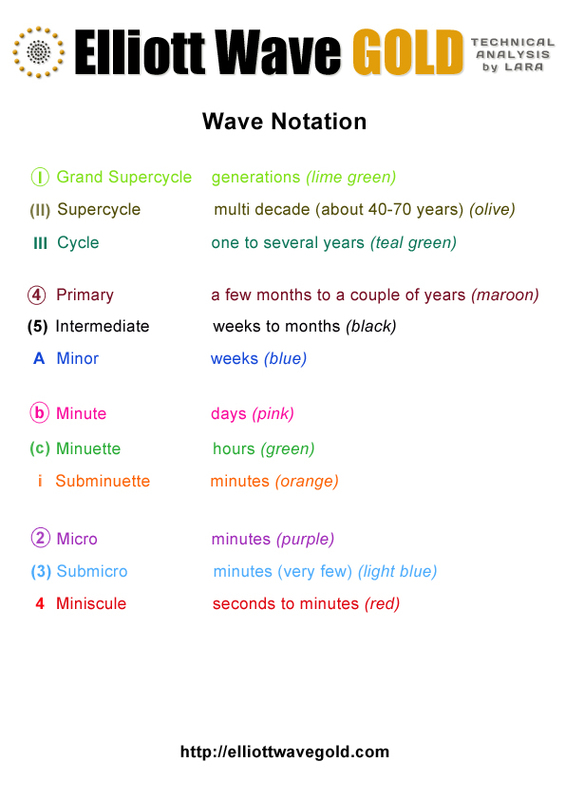 Within subminuette wave iii micro wave 2 may not move beyond the start of micro wave 1. 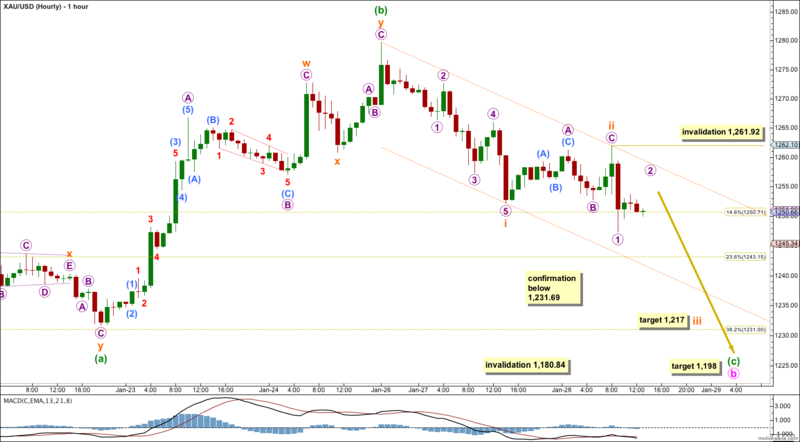 This wave count is invalidated with movement above 1,261.92. I am using a data feed from FXCM. It has a high of 1,279.66 for January 26th. Statement in analysis , “Movement above 1277.97 has provided confirmation that primary wave 4 is not over.” So far highest price of gold was 1276.80 on January 26th. Is that enough to call it confirmation?